He was interested in drawing and manual arts as well as science experiments since he was a child. He still remembers making a toy car that was powered by winding it up with a rubber band for independent research when he was a third-grader in elementary school. As a high school student, he saw a documentary TV program about robotic prosthetics and became interested in medical engineering. Until then, he had believed that robots could only be moved by humans manipulating buttons or sticks; therefore, he was amazed to see a robot reading human neural signals and, thus, enabling the prosthetics to move at the user's will. "This mechanism that I had never seen before had an impact on me." He looked for a university where he could study that sort of medical engineering and entered Kobe University. He then joined a laboratory that worked on medical care using image processing until he completed his doctorate degree. He went back and forth between Kobe University and Osaka University Hospital to continue his research. 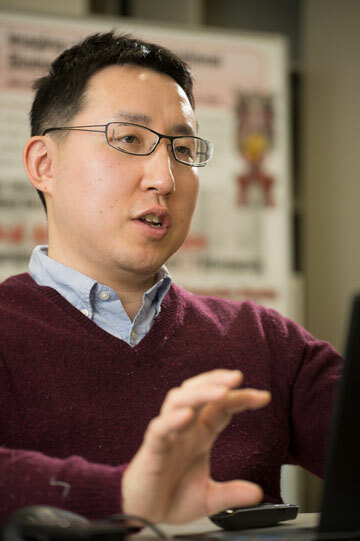 Since 2015, he has been working as an associate professor at Nara Institute of Science and Technology. How effective are rehabilitation programs? In Japan, approximately 50,000 people undergo artificial hip joint surgeries every year. He used to work on visualizing bone shapes in CT images to facilitate the surgeries. Low-resolution CT images in black and white, however, offered only a limited amount of information. What was worse, he had to use those images to find joints in which the disease had stripped off most of the cartilaginous tissues and the bones looked like they were fused together. He introduced physicians' empirical data using informatics to gradually improve the resolution. What was once believed to be invisible or impossible is now becoming detectable and feasible. For him, that is what makes scientific studies fascinating. 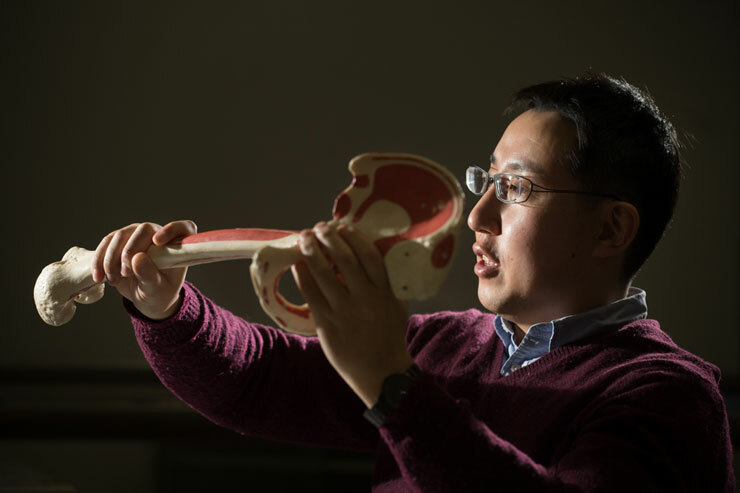 At first, the purpose of his research was to assist with surgeries, but he is now interested in the wonders of the human body itself. Which muscles become debilitated or tend to stay unchanged after a surgery? What are the differences among individuals? Are the current rehabilitation programs really effective? He says there are still many unknowns. "I would like to be able to present the program to elderly people, saying that even though it may be difficult for you to practice rehabilitation exercises - almost as hard as sports training - practicing this program just a little will be a shortcut to your recovery." If this technique can be developed further, it may be possible to create a system that can analyze the pitching forms or muscle movements of professional baseball players so that a change in pitching form or a way to build up specific muscles to improve a pitcher's speed can be suggested. "Ten years ago, few people could expect that computers would become this strong in the world of shogi. It would not be surprising if the same thing happened in sports science." 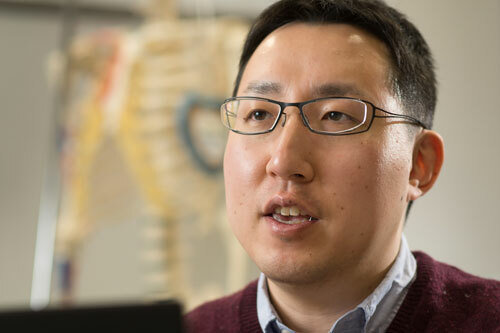 While he was at Johns Hopkins University in the United States for about a year, he was surprised to see how low the barriers were among the researchers. 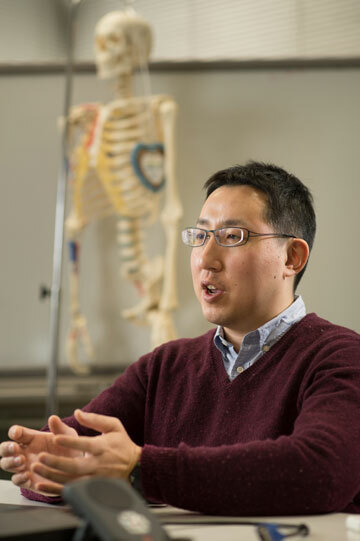 While students in Japan are divided into different laboratories, each headed by a professor, students as well as postdoctoral research fellows in the medical engineering disciplines were all in the same room at Johns Hopkins University. Students from a broad range of areas participated in a meeting attended by professors from different fields. "All the participants were contributing to the discussion in an equal manner, so I could not tell who was a great professor only by observing the meeting. People from different specialties meet and have discussions naturally. It is so different from the academic environment in Japan."